In The Language of Sparrows: A Novel by Rachel Phifer, teenaged protagonist Sierra Wright is blessed—or cursed, with a formidable intelligence. Experiencing little guidance for or understanding of her gift, she is misunderstood by both her peers and her teachers. She has retreated into a world of words and symbols where she teaches herself a multitude of tongues and devours books in their original languages. After the death of Sierra’s father, her mom April Wright struggles with her own grief while trying to reach her increasingly remote daughter. April hopes that relocating to a new city will offer the hurting pair a new start. In Sierra’s new setting, she experiences acceptance and understanding from a prickly and reclusive elderly man who shares Sierra’s passion for language and books, an insightful teacher of at-risk students, and a determined classmate who appoints himself a protector and is surprisingly astute about Sierra’s gifts and fears. The author deftly weaves the characters together as they work through their own challenges and act on their concern for Sierra and one another. 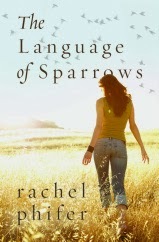 I found The Language of Sparrows a satisfying tale of hurting individuals who connect with each other and in doing so breach walls of secrets, estrangement and pain. In the process they experience healing and transformed lives. It sounds good. Even the title is beautiful. One for the kindle I think. Thanks for the review.